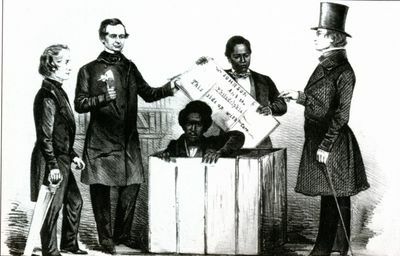 “Abolitionist William Still holds the lid of a box that carried runaway slave Henry “Box” Brown to freedom via freight train to Philadelphia in a box shipped from Virginia in March 1849. Underground Railroad activities persisted throughout the Civil War and likely included helping black troops of Camp William Penn to reach freedom. One slave catcher was repulsed from the camp by soldiers.”--Donald Scott, Sr.